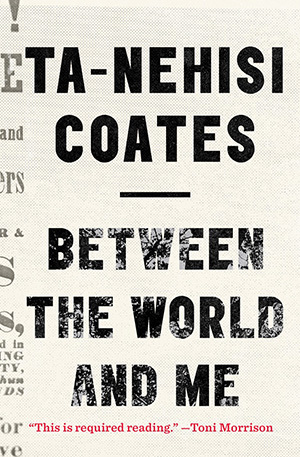 Ta-Nehisi Coates’ Between the World and Me is, at first glance, a portrait of one African American’s revelations about race, identity and the world as viewed in the form of a letter to his teenage son, Samori. Coates attempts to address the nature of being black in today’s America, where unarmed African American men and their children are being killed at the hands of police officers. The book first offers us a glimpse of Coates’ youth, growing up in Baltimore with a pervasive sense of fear ingrained into him by authority. His mother, who insisted that, while holding his hand and crossing a street, “…if I ever let go and were killed by an onrushing car, she would beat me back to life” (Coates 16). His father, too, tried to instill in him fear, fear not of his father, but of authority, of police. Once, Coates recollects, he wandered away from his grandparents at a park, who then “spent anxious minutes looking for him” (16). Upon learning of this, his father beat him, telling his mother, “‘Either I can beat him, or the police’” (16). The police, Coates tells his son, “have been endowed with the authority to destroy your body” (9). But the police are not the only thing Coates learned to fear. He also feared the streets, where “death could so easily rise up from the nothing of a boyish afternoon, billow up like fog” (20). He feared the crews who walked them, who “would break your jaw, stomp your face, and shoot you down to feel that power, to revel in the might of their own bodies” (22). Coates juxtaposes his reality of the streets with the clichéd world of the suburbs, of “pot roasts, blueberry pies, fireworks, ice cream sundaes, immaculate bathrooms, and small toy trucks that were loosed in wooded backyards with streams and glens” (20). Coates associates this world with what he calls “the Dream,” what he sees to be an exclusionary dream only for whites, the origin of which lies on the suppression and oppression of blacks. Throughout this engaging narrative, there is, in some passages, a tendency to generalize. Despite the personal nature of his experiences, his take on the notion of racism and white supremacy, is impersonal – he sees these things as unyielding and faceless forces. There was the reaction of any parent when a stranger lays a hand on the body of his or her child. And there was my own insecurity in my ability to protect your black body … I was only aware that someone had invoked their right over the body of my son. I turned and spoke to this woman, and my words were hot with all of the moment and all of my history. She shrunk back, shocked. A white man standing nearby spoke up in her defence (94). To Coates, this woman is force of nature, ‘a comet’ he calls her. At this moment, Coates sees this woman as a white person attempting to lay claim on the body of his son. He tells the reader that, as he confronted the woman, “my words were hot with all of the moment and all of my history” (94). While I do not claim to know the motives or underlying factors that sparked the incident, there is a chance that the woman did this act, not because of Samori’s race, but some other factor which the reader is not aware of. By making her into a ‘comet,’ she ceases to be a person, a person with free will and a responsibility for her own actions- whether they be good or bad. It is this tendency to generalize, however that also provides the reader with the narrative, almost debate-like quality of the novel, which remains one of its strengths. Between the World and Me is, overall, a fascinating portal into one African American’s struggle with race, identity, and the world and one I would highly recommend. About the Author: Ta-Nehisi Coates is a national correspondent for The Atlantic and the author of the #1 New York Times bestseller Between the World and Me, a finalist for the National Book Award. A MacArthur “Genius Grant” fellow, Coates has received the National Magazine Award, the Hillman Prize for Opinion and Analysis Journalism, and the George Polk Award for his Atlantic cover story “The Case for Reparations.” He lives in New York with his wife and son.